MPC's Rigid Anodized Aluminum blank labels and tags are an ideal choice for on-site marking using YAG or fiber lasers, or engraving processes. They provide exceptional resistance to weather, abrasion, corrosion, chemicals and solvents. Our rigid label backgrounds are available in black or a variety of colors and are sealed beneath a durable anodic layer that provides superior abrasion resistance. MPC’s rigid anodized aluminum blank labels are strong and lightweight. 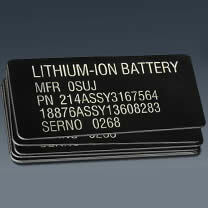 The thicker aluminum lends greater impact resistance in rugged environments making them ideal for asset tracking and product identification labels, property ID tags and more. Why Choose MPC's Rigid Anodized Aluminum Blank Labels & Tags? Manufactured using anodized aluminum face stock. After fabrication, edges and holes of the finished parts are not anodized, but an optional secondary process will anodize, alodine or paint edges for increased durability and protection (on thicknesses of .063” or greater). Anodized aluminum face stock (optional thicknesses .012”, .020”, .032”, .063”, .090”, .125”).